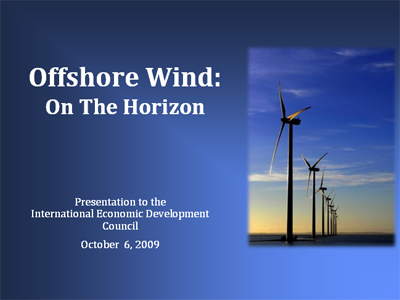 Smooth Sailing for Offshore Wind Project? The top environmental official in Delaware explains how a unique coalition won support for the $1.5-billion Bluewater deal. 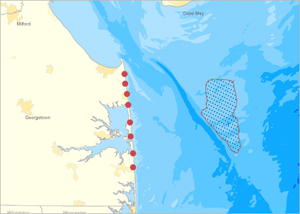 ver heard of a coastal wind farm getting 90-percent approval ratings from area citizens? Philip Cherry says that’s exactly what happened with the planned Bluewater Wind project off the coast of Delaware. "What drove the success of this project in Delaware was public opinion," says Cherry, policy director for the Delaware Department of Natural Resources & Environmental Control. "Bluewater Wind received 90-percent support from Delaware residents, including 78-percent support from people in the local area, versus only four percent who opposed it. Cape Wind in Massachusetts had 90-percent opposition." The difference, Cherry explained to the International Economic Development Council Annual Conference in Reno, Nev., on Oct. 6, was that all parties in Delaware took a proactive approach to public relations and laid the groundwork early on to frame the project as an environmental step forward for the entire state. Cape Wind is the proposed offshore wind farm that aims to install 130 wind turbines in Nantucket Sound just five miles (eight km.) south of Cape Cod. That project has been delayed for nearly a decade by vehement public opposition, including protests from the Kennedy family and former Massachusetts Gov. Mitt Romney. Bluewater Wind, by contrast, has sailed along with strong support from the citizenry, Public Service Commission, Legislature, and other state and local leaders. The $1.5-billion project would generate 230 to 450 megawatts of wind power upon completion in 2013 or 2014. The 150 turbines would be installed 12 miles (19.3 km.) east of Rehoboth Beach — a distance that makes them barely visible to swimmers, surfers and others on the coast. "Public opinion won the day," noted Cherry. "It took citizen support and activism in front of the PSC, Legislature and previous governor. We had a coalition of advocates for addressing climate change, improving public health and creating clean energy. It was the perfect storm." The full-court-press educational effort forged a public response that was 19-to-1 in favor of the project, says Cherry. "This is the first and only purchasing agreement in the United States for offshore wind power. Bluewater Wind won out over a proposed coal carbon capture-and-sequestration project." Delmarva Power, the state's largest electric utility, will purchase the power from Bluewater Wind and use it to meet up to 30 percent of the utility’s residential demand, or about 110,000 households. In addition, Delmarva likely would meet its state-mandated 20-percent renewable portfolio standard by the end of 2014, five years ahead of schedule. The Delaware Public Service Commission approved Delmarva's 25-year power purchase agreement with Bluewater on August 1, 2008. More than 1 gigawatt of offshore wind power has been proposed in four projects along the Northeast U.S. coast. They are Bluewater Wind in Delaware, Garden State Offshore Energy in New Jersey, Deepwater Wind in Rhode Island and Cape Wind in Massachusetts. "Delaware is the furthest along among all of these planned offshore developments," noted Cherry. "The Mid-Atlantic region will be the first offshore wind market in the U.S., mainly because it offers a huge offshore resource." One recent study shows that the Mid-Atlantic offers 835 GW of total offshore wind capacity with an average output of 330 GW. An output of 185 GW would be enough to supply the entire energy demand of all East Coast states, including electricity, heating and cooling of buildings, and propulsion of automotive vehicles. According to the U.S. Department of Energy, the Mid-Atlantic coast provides Class 5 and Class 6 winds — considered to be among the best and most sustained winds for generating power in all of the U.S.
"Offshore wind, which produces zero carbon emissions, holds the potential to reduce our emissions by 68 percent," says Cherry. "The large, shallow continental shelf just off the Mid-Atlantic coast makes it relatively attractive for the installation of wind turbines." Delaware also benefits from its unique geographic location on the East Coast. "The Mid-Atlantic has had the fewest hurricane landfalls of any region in either the Gulf Coast or the East Coast," said Cherry. "Windmills typically are built to withstand Category 3 hurricanes and winds up to 120 miles per hour. Since 1950, no major storm has hit the coast of Delaware." Cherry contends that the wind resource will help bring price stability to the region. "Wind power is cost competitive today in the U.S.," he says. "Offshore wind costs will be competitive in the Mid-Atlantic and Northeast earlier than any other region, as grid congestion drives high peak prices due to limited generation and transmission." Cherry also predicts a significant regional economic impact from infrastructure projects that will be created by the offshore wind farm. "Business opportunities will include the manufacturing of nacelle components, mechanical and electrical gears, blades and other forms of steel fabrication. Then there’s the long-term need for construction of transmission lines to connect the wind sites to state loads." The first order of business is for Bluewater Wind to find a new owner. Robert Propes, Delaware project manager for Bluewater, said recently that more than one company has expressed interest in purchasing the project from Babcock and Brown. He added that a new owner would be announced within two months. Next, Bluewater would need to apply for ocean floor leases from the federal Minerals Management Service. That process potentially could take several years, but if all goes as planned, notes Cherry, construction could begin in 2013.